Two widows living in a retirement community in Middle Tennessee are not content living in the paradise known as Fairlawn Glen. Social activities and rural beauty are not enough for Leslie & Belinda. Leslie, in particular, finds paradise to be boring, and she sees mystery and life threatening peril everywhere. When the annual Highway 127 yard sale starts in August, and runs right through the Glen’s closest city, the congestion and carnival-like atmosphere has a Leslie & Belinda Mystery written all over it. 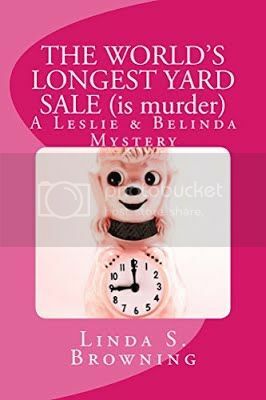 When Leslie happens upon a body left in a shed like so much yard sale detritus, she endeavors to solve the murder along with best friend, Belinda. After all, as Leslie states, “When people find a dead body, those people have the responsibility of finding out how and why that person ended up dead.” Leslie’s eight pound Maltese-mixed-with-some-other-kind-of-small-dog is right in the middle of the mystery and peril—as always.